My wife and daughter went to see The King's Speech a few weeks ago, and they couldn't stop talking about how great it was. So, after a few weeks of hearing about this movie, my daughter (who is nine by the way) convinced me to go see it again with her. I was amazed at how good this movie was. 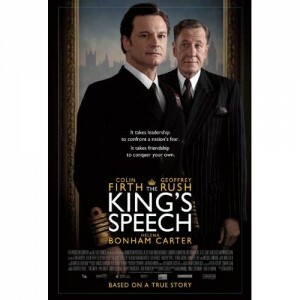 It is the true story of how King George VI of England (father of Queen Elizabeth) successful overcame a traumatic speech impediment (caused by public speaking fear) in order to give a fantastic speech just as England was entering World War II. England was in a desperate situation having just a couple of decades prior already participated in the First World War, Hitler had just declared war against them, and the new king was crowned because his older brother had abdicated his thrown in order to marry a divorced bride from the US. Anyone would have been terrified to give such an important speech while the world was listening, but King George VI had a stutter that became more pronounced when he became more nervous. The movie is about a "speech therapist" (really a presentation coach) who helped him diminish his fear and reduce his impediment dramatically. A very heartwarming story that was extremely well acted. You will absolutely love this film.